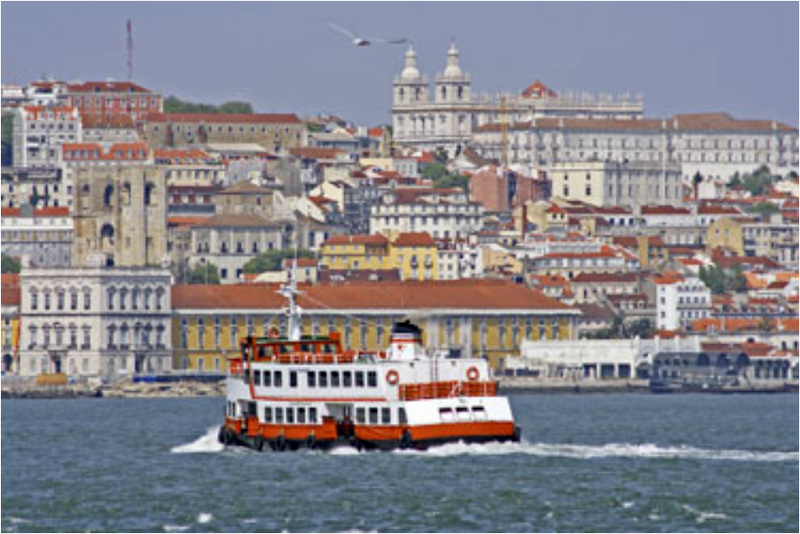 The 23rd annual World Conference on Educational Multimedia, Hypermedia & Telecommunications (ED-MEDIA) took place from June 27 to July 1 in Lisbon, Portugal. The event brought together approximately 800 participants from 60 countries. At the backdrop of the beautiful Faculty of Letters Campus at Lisbon University, teachers, researchers, software vendors, instructional designers, administrators and multimedia authors discussed future directions at the crossroad of education and technology – which happened to blend perfectly with experiencing Portuguese hospitality! 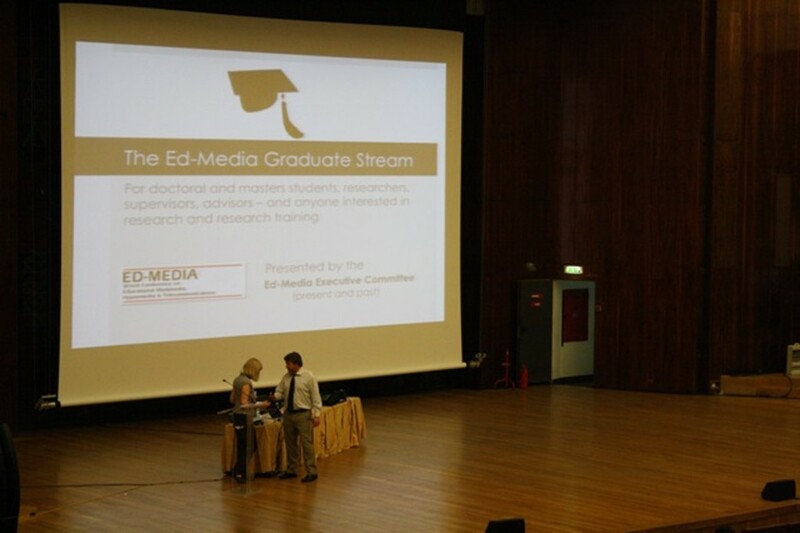 ED-MEDIA attracts participants from various fields such as pedagogy, educational psychology, computational science and information science. Organized by the Association for the Advancement of Computing in Education (AACE), the annual conference takes place at various locations in the US, Canada, and, approximately every third year, Europe. The attendees of this year’s event experienced a packed conference program. In addition to various keynotes, invited lectures and an extensive graduate program track, approximately 600 presentations, posters, workshops and symposiums were competing for their attention. This report mirrors my own eclectic view based on four conference days that allowed participants to choose from up to twelve concurrent sessions. This year’s ED-MEDIA introduced a great way to enrich the conference’s poster session, Pecha Kucha, the Japanese word for chit-chat. A select number of presenters is allowed to present 20 slides, shown for 20 seconds each. Personal discoveries during the poster session were Mark Brown’s Pecha Kucha on “Open Educational Resources in Australia: a Cross Sector Environment Study” and the Project “OER-Commons-Greens” – a web site dedicated top collecting OERs in the realm of sustainability. It is utterly impossible to adequately summarize the topics of ED-MEDIA. As David Kennedy, invited speaker from Hong Kong University, jokingly remarked: “Clearly the theme of this conference is …. ‘What is my favorite pet!’” However, certain trends stand out, such as open learning, e-books, mobile learning applications and the effects of lecture capturing. Prof. Kennedy presented, for example, results from a project on using smart phones as learning devices – outside and inside the classroom, challenging the typical mobile-free classroom setting: “Students used to pass notes in class. Did they ban paper?” A heated discussion erupted around openness and standardization – particularly of educational apps for mobile learning. Prof. Kennedy offered a balanced view on the subject: Apple’s ecosystem, on the one hand, can be perceived as problematic; on the other, it offers a consistent environment with high usability. In spite of some organizational slip-ups like missing name tags during registration on Monday and Tuesday, the conference site was characterized by its efficient organization and helpful atmosphere. Even more important, the ED-MEDIA 2011 conference continues to be academically competitive with an acceptance ratio for full paper submissions of 50% this year. Eleven submissions were honored with an outstanding paper award. On Thursday, I was able to present my own current research activities centered on personal learning experiences with open educational resources. Given my research interests, I particularly enjoyed the vivid discourse on the topic of openness in education and academia. My experience was tainted a little bit by the cancellation of a two-hour symposium on the co-creation of open content. Alas, given the amount of presentations, each day was accompanied by program changes, additions and cancellations…. My favorite part of the conference was the last keynote from Andrew Law, Director of Open Media, Open University (UK). He described the open education activities of OU to support informal learners and tackled an important distinction: access and availability do not necessarily lead to engagement or activity. All in all, I left Lisbon with plenty food for thought and inspirational ideas. Hence, I conclude the report with the one Portuguese word that probably all conference participants learned during their stay: “Obrigado!” Thank you! I believe we are at a point in time that is comparable to the changes in education that was brought about by printed books. Prior to printed books we used systems of apprenticeships and scholars sitting at the feet of a few philosophers or master scientists. Print enabled teachers to transfer scholarly knowledge and skills to the young. Today the digital world allows us to store and transmit skills and knowledge not only in print but is video and audio formats. We can even create simulated games that enables a person to fly an airplane or engage in problem solving teams seeking new knowledge. We can for example build a virtual habitat on Mars and learn not only Mars science but how to survive in a Mar climate. The Russians are actually using a a Mars simulator where a half dozen men live in a Mars simulator for 18 months. They are constantly observed but their communication outside their simulator takes as long as if they were on Mars. The technology is here the question is how fast will we learn to use it effectively. The Secondary school principals who have tried to prohibit cell phones and Ipads are now seeking ways to use them in the learning process. Just as printed books changed education digital technologies will radically change all of our educational institutions. Learning is available any time and any place a learner can tap into the worldwide Internet. I was interested to hear that George Siemens is still working on his PhD. Has his commitment to open technologies lead to a neglect of traditional academic study? Promotion and reputation are still based on traditional criteria in most universities. At this years conference I was pleasantly surprised with the high level of interest in Open Querys proactive services for MySQL and MariaDB and specifically our focus on preventing problems while explicitly not offering emergency services..Ill describe what this is about first and why I reckon its interesting. But a significant number of companies we spoke with at and around the conference were very interested in our services exactly because of the way we work and so that to me was interesting news. Is there a listing of who won the outstanding poster awards somewhere?